Cancer cells are like villainous cyborgs in an action film: they simply won’t die. Molecular biologist Weihang Chai seeks ways to terminate them. The associate professor in the College of Medicine studies the role of telomeres, the protective tips of chromosomes, in tumor growth. Every time a normal cell reproduces, a snippet of the telomere is lost. When telomeres become short enough, the cell stops growing and eventually dies. But in a cancer cell, something prevents telomeres from shortening. The cell can reproduce again and again and keep on growing. In a lab on the WSU Spokane health sciences campus, Dr. Chai and her colleagues search for keys to the telomere’s persisting length. If they can block telomeres from the never-shortening “survival mode,” cancer cells can die. 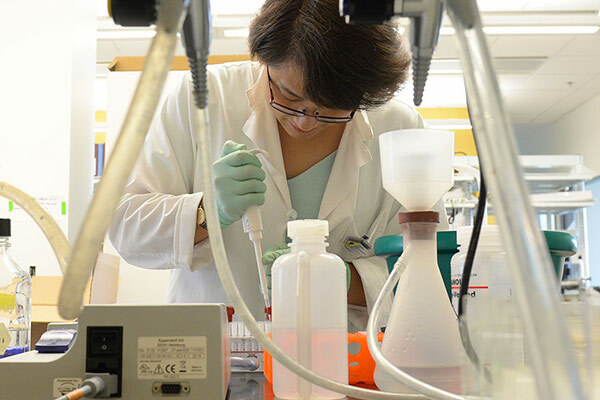 With funding from the National Institutes of Health, the American Cancer Society, and the CONCERN Foundation, Dr. Chai and her team focus their research toward an ambitious goal: eradication of cancer. Their discoveries may lead to breakthroughs in cancer therapy, as well as new ways to fight another enemy: aging.